From freshly planted young trees to well rooted older trees, they all require attention during the autumn months so they are prepared to weather the harsher temperatures and conditions of the coming winter. Consider the following tree services to facilitate the heartiest, healthiest trees year-round. This step should always be a part of annual tree servicing. When you hire tree service in Las Vegas, make sure to discuss what type of fertilizer is best for the trees in your yard, and confirm they will apply it properly before winter arrives. Good fertilizer offers trees the nutrients they need, and it helps them stay resilient through harsh weather. Limited foliage, hard ground, and less outdoors activity make it much easier for arborists to successfully remove trees efficiently. Tree removal in Las Vegas should always be done during the cooler months of fall and winter. Tree trimming in Las Vegas during the fall makes for the healthiest trees in the spring. Pruning is essential for safety since dead branches are likely to fall at any time, which can cause significant injury. It’s also necessary for facilitating proper growth and protecting the overall structure of the tree. Trees don’t stop needing water once the temperatures drop. Proper tree service includes a reliable method for regular watering for both young and old trees. Although Las Vegas winters are not as harsh as other places in the country, the lower temperatures require some planning to keep trees fortified and healthy for the warmer months down the road. 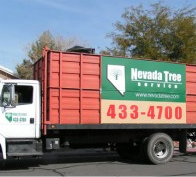 For the best tree service in Las Vegas, contact the experts at Nevada Tree Service to ensure your landscaping efforts don’t wither away over the coming months!